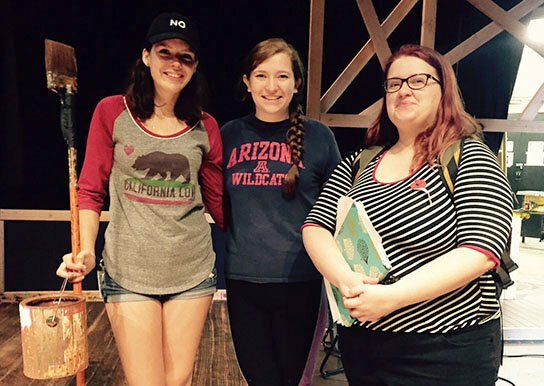 “Our Town” designers prepping for the play, from left, assistant stage manager Jennifer Lang, stage manager Jennifer Estrada and hair and makeup designer Madison Kesterson. For stage manager Jennifer Estrada, the message of Ethington Theatre’s “Our Town” is both poignant and personal. Our Town, which follows the loves and lives of Emily and George of Grover’s Corners, N.H., from 1899 to 1913, is an intimate experience that packs a powerful reminder: Pay attention to the wonderful things in life — before it is too late. 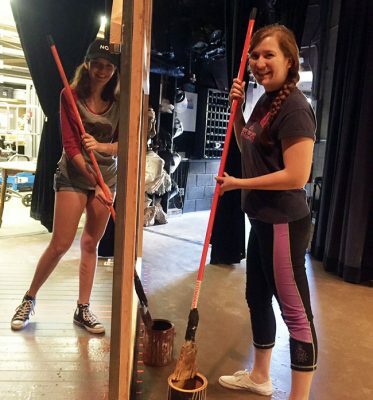 Assistant stage manager Jennifer Lang (left) and stage manager Jennifer Estrada paint the stage a week before opening night. Our Town is unusual in that students hold key leadership positions, a criterion for entering the prestigious Kennedy Center American College Theatre Festival in February. GCU’s 2015 production of “Scapin” was selected as an entrant last season. Our Town’s student designer team includes Laynie Nelson, set design and costume; Armani Randolph, lighting, and Madison Kesterson, hair and makeup. Assistant stage designer Jennifer Lang, a freshman, said the actors act out the props and furniture. Kesterson was faced with making characters look older without benefit of age makeup or adding gray to the hair. She said hairstyles and facial hair will signify maturation. “It’s different because it’s a period show,” Kesterson said. In today’s society, it has become the norm for many people to stare at screens, whether on a smart phone, computer or TV. Our Town reminds the viewer to put down the screens and look up to see what’s right in front of us. The narrator is the guide through Grover’s Corners and speaks directly to the audience. The boy next door who matures from irresponsible teen to father, husband and farmer. We follow her from her girlhood through her wedding, life and death.